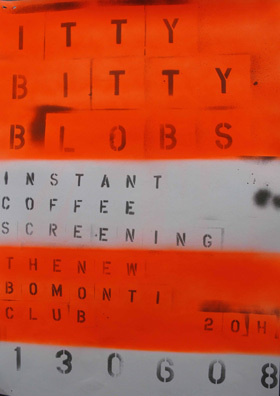 Against the backdrop of Friday the 13th Instant Coffee will screen our favourite itty bitty videos of rainbows, pink horses, blobs, pretty lights to offset the ominous day and night. Worpswede is situated approximately 25 km to the northeast of Bremen in the middle of Devil's Moor. It became widely known because of the artists who settled there at the end of the 19th century: thus Heinrich Vogeler, Otto Modersohn, Paula ModersohnBecker, Rainer Maria Rilke and Clara Rilke Westhoff founded the tradition of Worpswede, which has been maintained up to the present day, os an artists' colony also known affectionately os a "world village" : The beautiful landscape, the historical sites associated with the first generation of artists and numerous galleries attract many visitors each year.. The Kuenstlerhaeuser Worpswede is a place of international encounter for professional artists. The aim is to encourage professional artists in the sectors of the fine arts, literature and sound art by awarding residential scholarships.The Kuenstlerhaeuser Worpswede wishes to offer the sponsored artists the opportunity to develop their work and realise their ambitious projects.The outcomes as varied as they may be will be frequently presented to the public. Over 400 artists from over 35 countries have been guests of K�nstlerh�user Worpswede since 1971. The first studio apartments were made available in 1971 by the association known as Atelierhaus Worpswede e. V., to artists as a place to live and work. This is the very first set of studio apartments of this kind established in the Federal Republic of Germany.It was continuously extended and adapted to the needs of the artists under the directorship of Martin Kausche, co-founder of the association and its chairman for many years. Studio apartments for the artists were also established at the Barkenhoff estate in 1981 with the establishment of the Barkenhoff Foundation Worpswede, whose mission is to administer the estate of Heinrich Vogeler. Atelierhaus Worpswede e. V. and the studios of the Barkenhoff Foundation have been under joint artistic management since the beginning of 1997.